It’s LIQUID Group and International ArtExpo, in collaboration with VALORIZZAZIONI CULTURALI | ART-EVENTS, are proud to announce the opening of Contemporary Venice – It’s LIQUID International Art Show, international exhibition of photography, painting, video art, installation/sculpture and performance art. During the event, will be also presented Hybrid Identities, international experimental video and performance art festival. 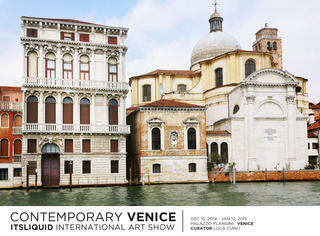 The exhibition, curated by Luca Curci, under the patronage of the city and province of Venice, will be held in Venice, in the prestigious Palazzo Flangini, from December 15th 2014 to January 12th 2015. FREE ENTRY. Click here to download the invitation card. The opening of the event will be on December 15, 2014 at Palazzo Flangini, starting from 06.00 PM (free entry). The event is curated by Arch. Luca Curci (Founder of LUCA CURCI ARCHITECTS, International ArtExpo and It’s LIQUID Group) and organized in partnership with VALORIZZAZIONI CULTURALI | ART-EVENTS.